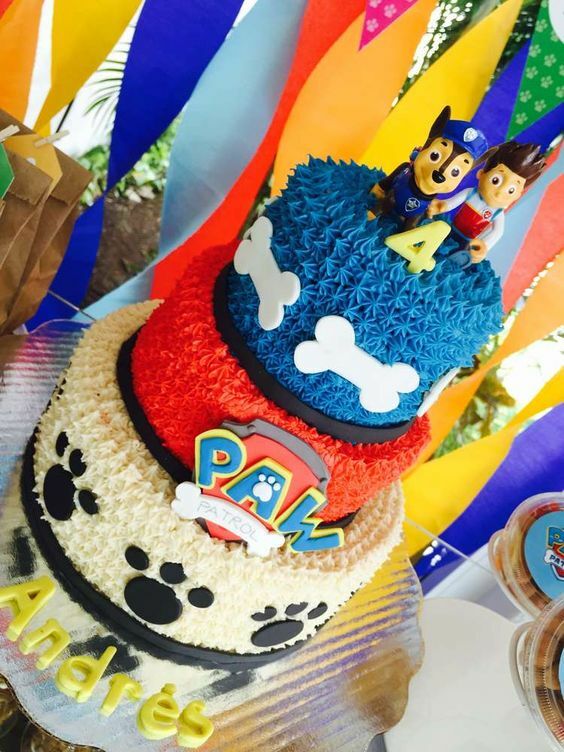 Paw Patrol is on a roll and so are these amazing Paw Patrol birthday cakes! Find Paw Patrol cake ideas for your child’s Paw Patrol birthday party right here with these creative cake designs! 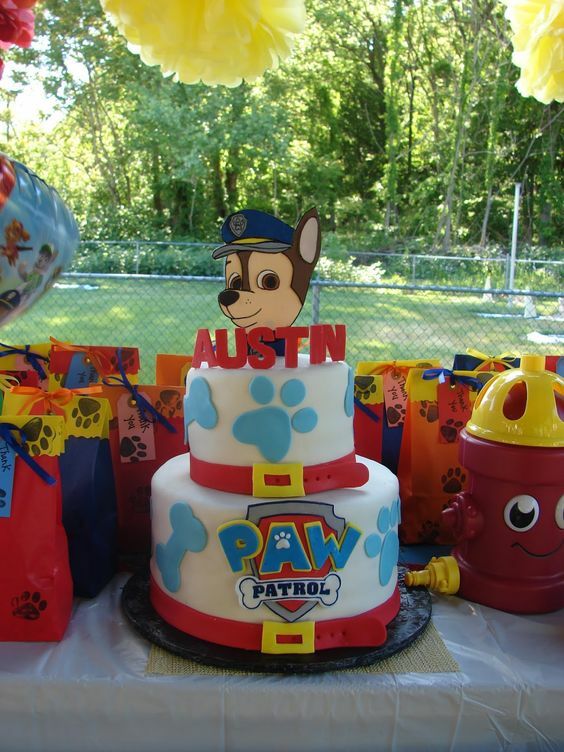 Are you planning a Paw Patrol party for your little one and need some paw patrol cake ideas? If so, you will love these 10 Perfect Paw Patrol Birthday Cakes! A Paw Patrol party theme is great for a boy our girl. There’s tons of fun inspiration out there for games, party favors, decorations, puppy inspired food, and more! First, let’s focus on the birthday cake. The cake is the centerpiece of the dessert table, so if the cake is on point, you’re good to go! So, whether you’re looking for a paw patrol cake for a girl or boy, there’s something here for everyone to make your paw patrol party one to remember. And, if you love to bake and want to know how to make a paw patrol cake, Cookies, Cupcakes and Cardio has a great cake tutorial where she makes a Paw Patrol Cake shaped like a dog pow with a paw print surprise inside! It’s super cool and the kids will love it! Looking for more dessert ideas for your Paw Patrol party? Check out these Easy Puppy Paw Print Cupcakes. The kids will absolutely love them! Get some more great inspiration for your dog-themed party with this Adorable Puppy Themed Birthday Party. Don’t worry, there’s more Paw Patrol Party Ideas for Girls with these cute Paw Patrol Skye Party Ideas! 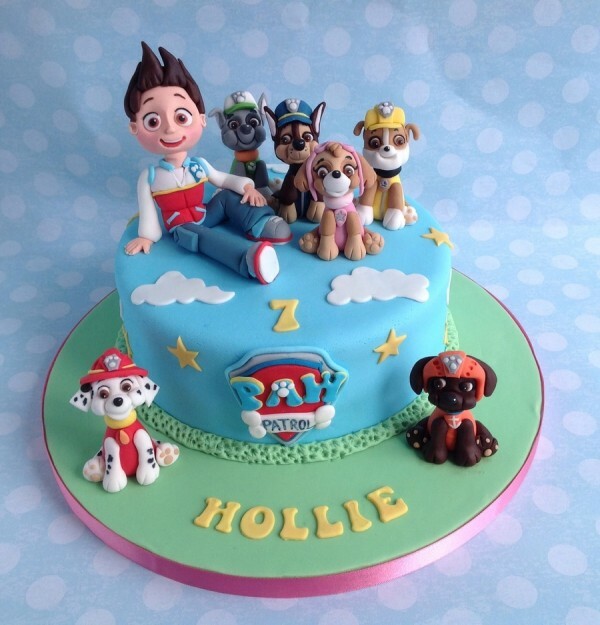 We just adore this Paw Patrol Character Cake from chocchippy. The fondant paw patrol cake toppers are perfection! The small light blue cake features the Paw Patrol logo on the front and is surrounded by clouds, stars and characters from the show. Even though this cake is smaller, the details really pack a punch and make a statement. Here’s another smaller cake with a great design. This blue Chase and Marshall Cake from Rebecca’s Cakes features puppy paws in a variety of colors, a red and gray dog collar around the bottom of the cake, and the birthday boy’s name on top of the cake with Marshall and Chase cake toppers. This Paw Patrol Construction Cake from Frugal Mom Eh! is one of our favorites! Any mom an attempt this cake at home and we know it will be a hit at any Paw Patrol party! All you need to create this cake is cake mix, buttercream icing, Kit Kats, M&Ms, and candy rocks. 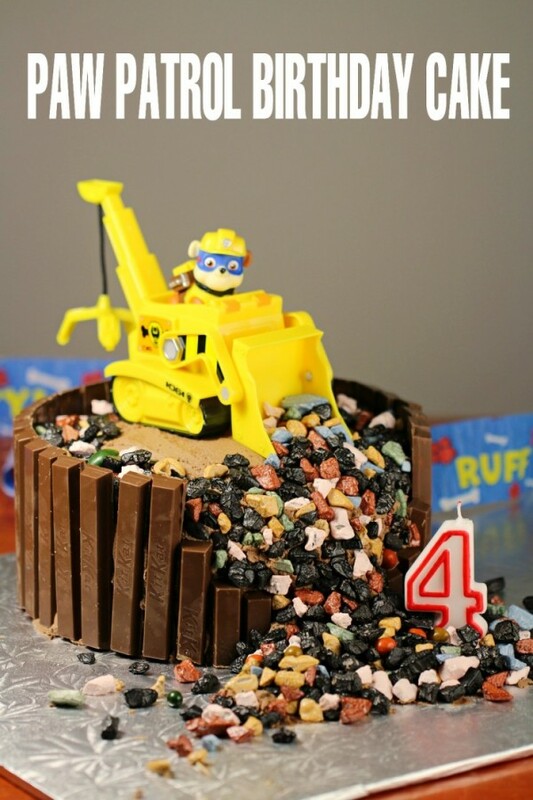 Top this unique birthday cake off with Rubble and his construction vehicle for the perfect birthday surprise! 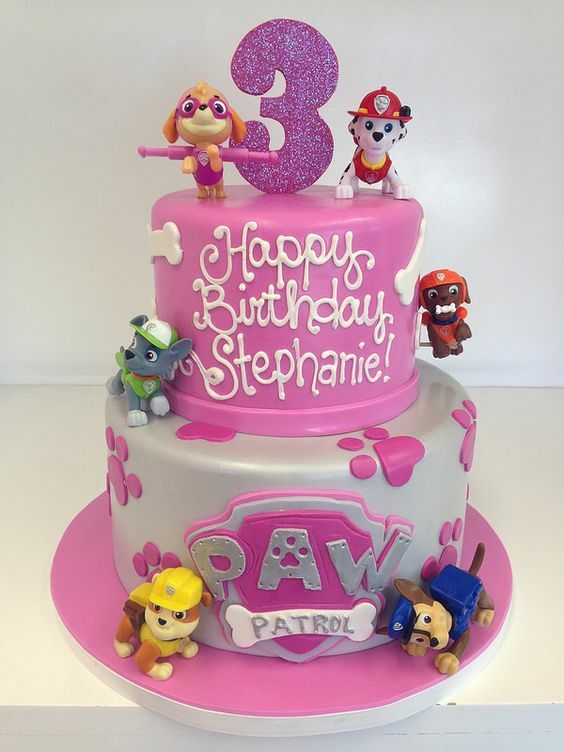 There’s nothing more adorable than this Pink Skye Paw Patrol Birthday Cake from A Sweet Design. This 2-tiered cakes is topped with a pink glittery number and features all of the pups, including our girl Skye on top. Other cute designs include pink paw prints, white doggie bones and the Paw Patrol logo in pink and silver. Any little girl would love to see this cake at her birthday party. 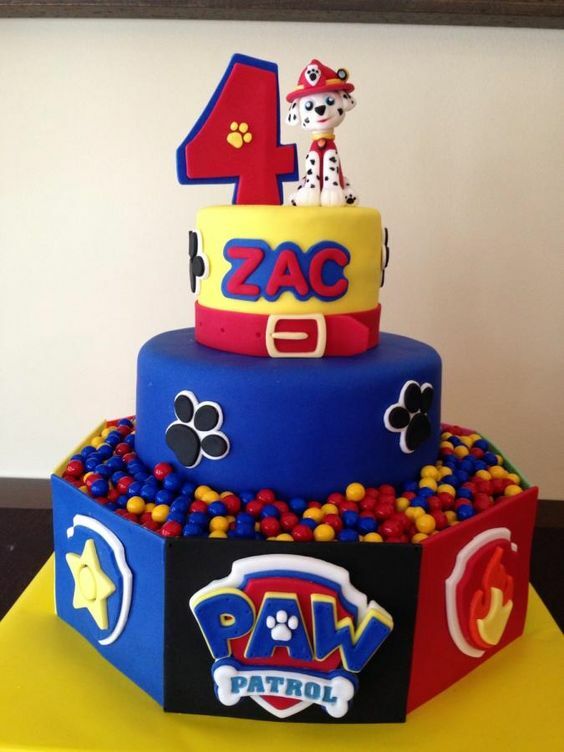 This brightly colored Paw Patrol Cake by Grey Grey Designs is another great cake that made our favorite’s list! We love how the yellow really pops with white, blue, red and green designs throughout. The pup’s badges made with fondant surround the first layer along with the white dog bones. The top layer features the show’s logo and birthday boy’s name. 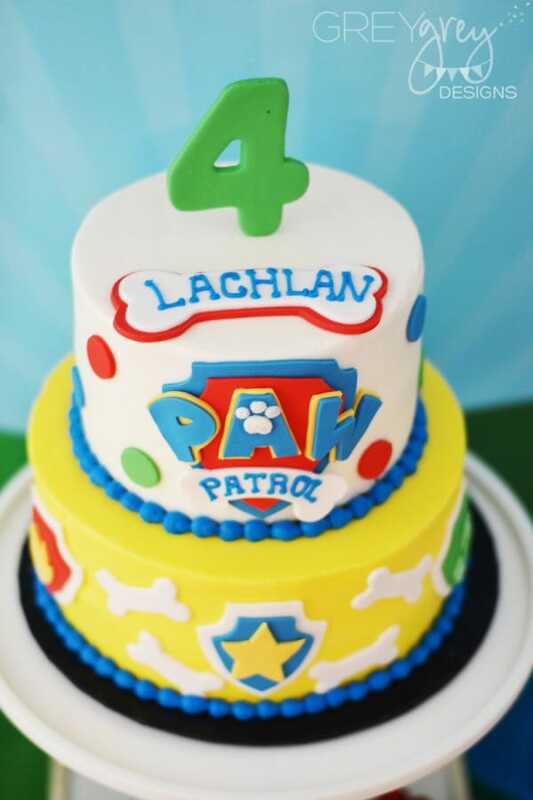 What an adorable Paw Patrol cake idea for any little Paw Patrol fan! This fun Paw Patrol Birthday Cake featuring a Chase cake topper by Pretty Things By Design is another favorite. Red dog collars surround each layer at the bottom of this 2-layer birthday cake. Extra large blue dog bones and puppy paws shaped with fondant decorate each layer for an eye-catching design. The birthday boy’s name in red fondant surrounds the cake topper and will have any little fan jumping for joy when they see this cake at their party! 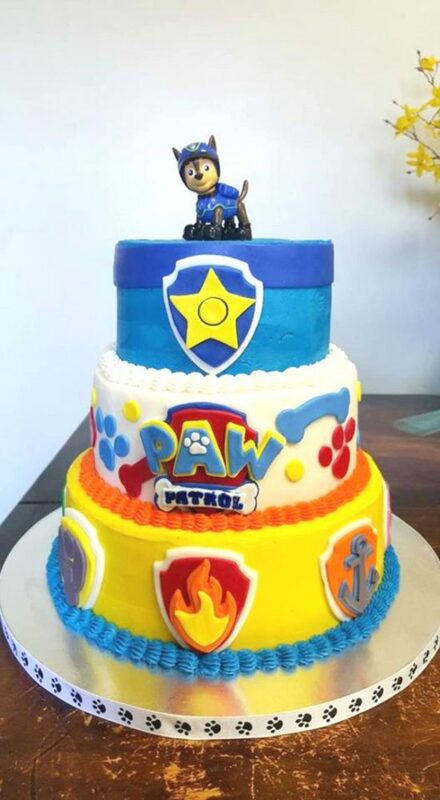 This large red, blue, yellow and white Paw Patrol Cake by Sugared Tiers is so unique. The bottom layer of the birthday cake features a “candy pool” of sorts surrounded by fondant pup badges and the Paw Patrol logo. While the coordinating candy fills the bottom layer the top 2 layers feature doggie paws, a red dog collar and the birthday boy’s name. The cake toppers include a number 4 and Marshall. Aren’t you just loving these 10 Perfect Paw Patrol Birthday Cakes?! We love the icing technique on this 3-tiered Paw Patrol Birthday Cake via Catch My Party. 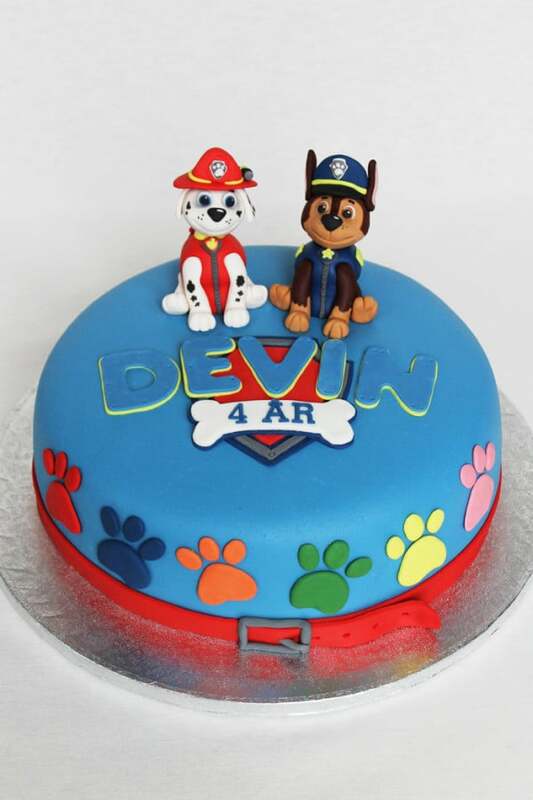 A white, red and blue layer topped with pup Chase and buddy Ryder make this cake unique, but the overall design stills stays true to the Paw Patrol theme. Dog bones and puppy paws round out this design for a truly spectacular birthday cake for one lucky birthday boy! Chase is on the case or should I say the cake!!! This Paw Patrol Cake by cbanks2004 is colorful, bright and just what any Paw Patroller needs for their big celebration! The pups badges adorn the bottom layer, while the logo, dog bones and puppy paws make up the second half of the cake design. The top layer of the cake is dedicated to everyone’s favorite pup Chase with his badge front and center. Topped with the Chase character this cake is perfect for any Chase fan! This Girly Paw Patrol Cake by Daisy Cake Company is perfect for any little birthday girl! This pink and blue cake certainly doesn’t disappoint with everyone’s favorite characters making an appearance on this impressive cake. 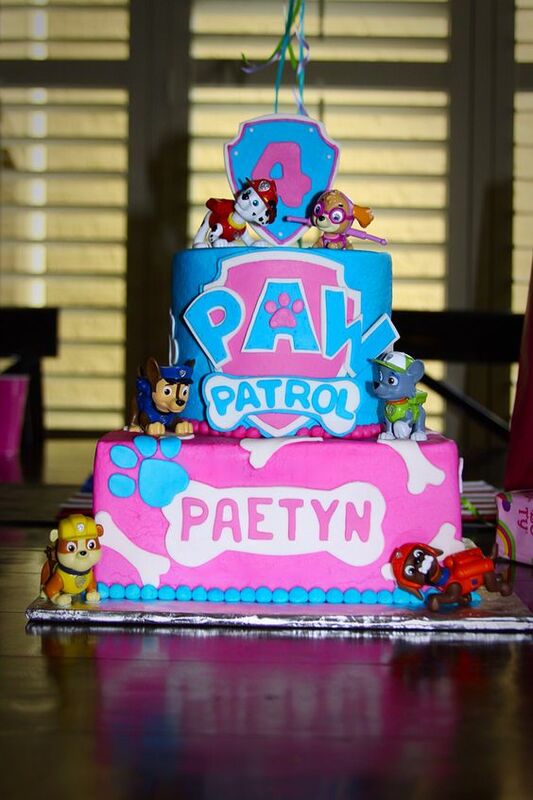 This cake would make the perfect centerpiece for a Sky Paw Patrol themed birthday party! Which one is your favorite of these 10 Perfect Paw Patrol Birthday Cakes? Let us know in the comments below. For more party ideas, follow us on Instagram @prettymyparty and Pinterest and join us in our private Facebook group.